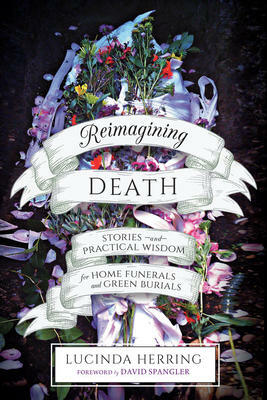 This is a beautifully helpful book for all those seeking to reclaim their innate and legal right to care for their own dead, create home funeral vigils, and choose greener after-death care options that are less toxic and more sustainable for the earth. More natural after-death care options are transforming the paradigm of the existing funeral industry, helping families and communities recover their instinctive capacity to care for a loved one after death and do so in creative, nourishing, and healing ways. In reclaiming these practices and creating new, innovative options, we are greening the gateway of death and returning home to ourselves, our bodies, and the earth. Lucinda Herring reminds us of the sacredness of death itself; her compelling stories, poetry, and guidance come from years of experience as a home funeral/green burial consultant and licensed funeral director dedicated to more natural and healing death practices. In Reimagining Death she shares with readers her experience caring for her own mother after death. Through storytelling and resources Herring also reveals to families the gifts of partnering with nature, home funeral vigils, sacred care at death, conscious dying (through the story of a Death with Dignity with accompanying photos of one man's planned death and after-death care), bringing laughter and a greater lightness of being to death, natural burials, and emerging eco-conscous dispositions. A valuable resource in planning for all deaths in all circumstances (with a chapter on what to do when a death occurs outside of the home), this book also guides readers on how to create an advance after-death care directive. More natural after-death care options are transforming the paradigm of the existing funeral industry, helping families and communities recover their instinctive capacity to care for a loved one after death and do so in creative, nourishing, and healing ways. In reclaiming these practices and creating new, innovative options, we are greening the gateway of death and returning home to ourselves, our bodies, and the earth. Lucinda Herring reminds us of the sacredness of death itself; her compelling stories, poetry, and guidance come from years of experience as a home funeral/green burial consultant and licensed funeral director dedicated to more natural and healing death practices.